Oyl 'N Vinega is a music group. 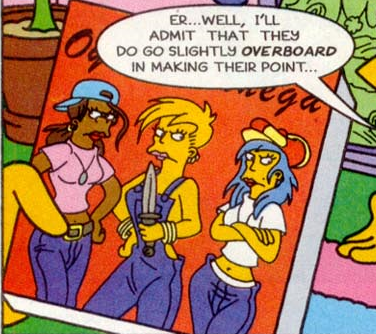 Lisa was listening to Oyl 'N Vinega whilst Marge tried to talk to her, and so couldn't hear her. When Marge found out what band it was, she was not happy that Lisa chose to listen to it. Comic story – The Exorsister! Modified on May 5, 2017, at 16:39.